This week we’re looking for something equal parts relaxing & immune-boosting, which led us to raw, local honey & ginger. 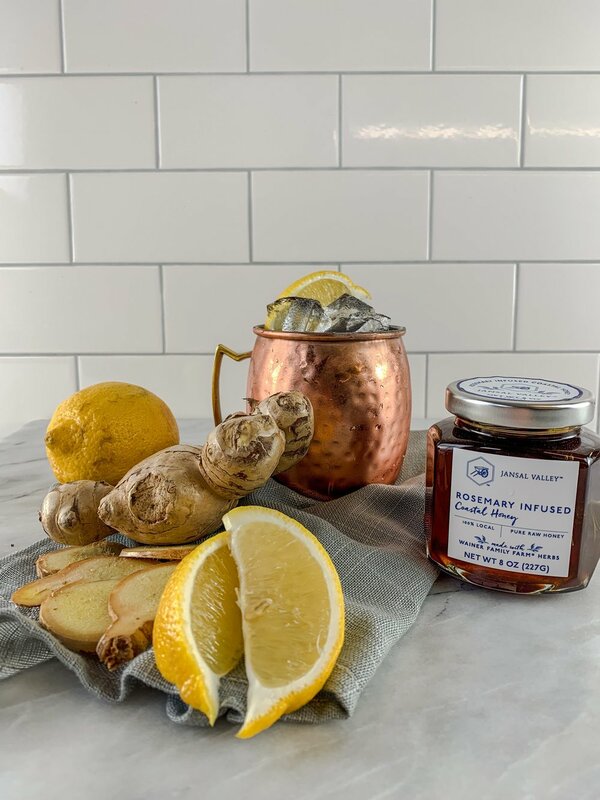 This special honey comes from just a few miles away from our facilities, harvested along the coastal Massachussetts and Rhode Island boarder. It is raw, never heated or pasteurized in any way, then infused with rosemary grown at our very own Wainer Family Farm. The result is a robust honey flavor with savory undertones, which perfectly balances the bright fresh ginger flavor. Cheers! In a mixing glass, combine the rosemary honey syrup, alcohol, and lemon juice. Divide the mixture evenly into four mule glasses filled with ice, then top off each glass with ginger beer.